Someone made the interesting decision of stealing a massive bounty of dry Ramen Noodles, driving off with their haul in a truck trailer in Fayette County, Georgia. According to news reports, the heist is being investigated along with of a string of thefts in the locality, including multiple car break-ins and a stolen motorcycle. Although it's unclear if the crimes are related, it isn't hard to imagine the suspect(s) getting hungry at some point during their thrilling crime spree, ultimately driving off into the Georgia night with $98,000 worth of the college dorm room fare. 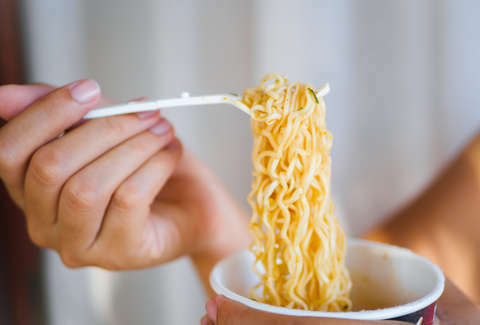 To be clear, a six-figure salary's worth of ramen is the physical equivalent of a fortress of the non-perishable foodstuffs, which typically retails for under $2.00 at mega-retailers like Walmart. It's enough sodium to bolster an army of bandits, and the loot should have fueled the suspect(s) in their pursuit of pilferage had they not left their ramen truck outside of a Chevron parking lot. Authorities found the 53-foot trailer next to the Chevron, which they believe was stolen between July 26 and August 1. Curiously, Sheriff Barry Bab told WTKR that the trailer's owner had permission to park at the gas station, and the truck "was 'secured' when it was stolen." Whatever that means. Unfortunately, there are far more questions than answers surrounding the illicit noodles, which will probably have to wait until they're submerged in boiling water and slurped up from a bowl. What these enterprising thieves planned to do with so much ramen is a question for the ages.